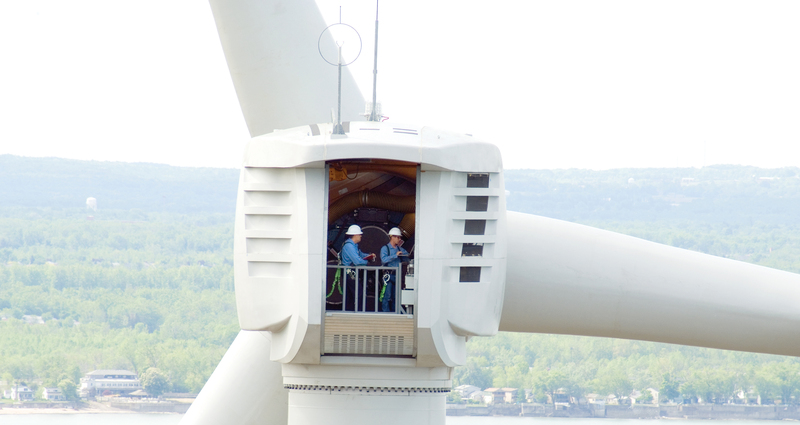 Condition monitoring systems can anticipate failures and allow turbine owners to schedule for repairs. An introduction to the approaches and technologies available. What approach - condition monitoring or hands on? The price of predicting catastrophic turbine breakdowns is open to lively debate. While some insist rigorous regular maintenance will always be the best answer, others argue that condition monitoring systems (CMS) can save a wind farm owner a small fortune. Use of such monitoring systems have seen growth in recent years across the US, while in Europe it is not unknown for insurance firms to practically mandate it before offering a policy to a wind farm. Yet still, the debate goes on about whether it is cheaper to pay into the $10s of thousands per turbine for the system? Or is it better to use common sense and an owner's manual throughout a turbine's 20-year life? CMS applied to wind turbines usually takes one of two forms. Vibration monitoring has been a more costly yet more widely used systems. Sensors are attached to gearboxes, generators and drive trains to provide real-time data streams that are transmitted to operators who monitor the results on a computer for changes that highlight a potential problem. Automated oil-particulate systems count metal pieces floating in lubricating fluid, either displayed as real-time data or stored for later examination. Increasing rates of gear-tooth or bearing particulate indicate trouble. Beyond those mainstay methods, acoustic monitors are more recent arrivals on the niche CMS market where dozens of competitors have popped up in recent years. Borescopes can take photos inside the gearbox, much like a medical procedure, but are not considered CMS because a complete scan can take eight hours and is largely inefficient unless specific problem areas are already known. CMS is now offered by many turbine manufacturers as standard equipment in some markets. Others offer it as a pricey factory add-on and some don't offer it at all - some firms dislike the intense scrutiny of CMS, preferring that the data remains proprietary. Some dismiss all such technology as unproven. So, many companies simply send a technician up-tower to collect gearbox oil in a vial and send the sample off to a lab for quarterly particulate counts - at $30 per turbine. A few others stick to the age-old method of rolling down their pickup-truck windows, driving slowly through the wind farm and listening. Those numbers are dwindling.